Discussion in 'Handbags' started by tFS Management, Jul 3, 2009. 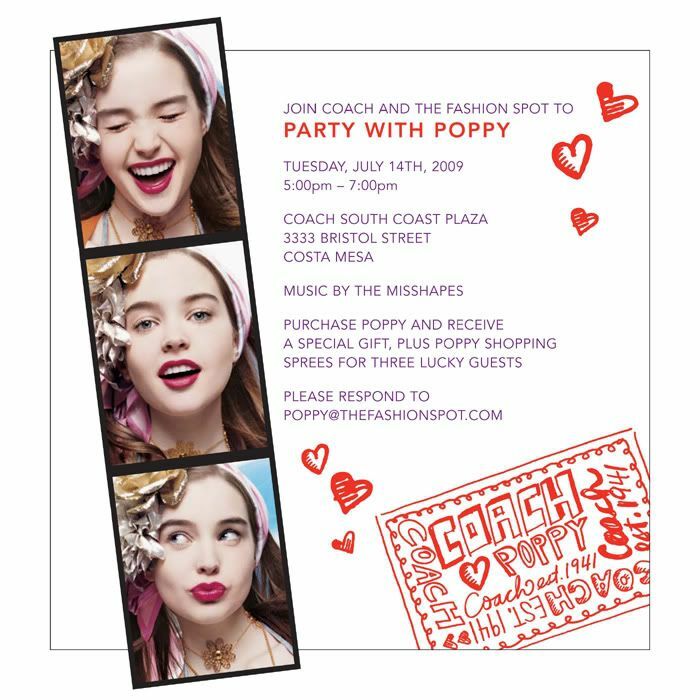 About Event: To celebrate the much anticipated launch of the Poppy collection, Coach is partnering with The Fashion Spot, the LA-based online fashion community, to co-host a celebratory fete in Coach’s premiere South Coast Plaza location. Guests will be able to indulge in a slew of Poppy-perfect treats, including a Poppy candy bar, exclusive Poppy presents with purchase, and a custom Poppy playlist created by famed NYC dj’s The Misshapes. Guests can also interact with the Poppy-razzi photobooth and see their photos instantly uploaded onto www.coach.com/poppy and Facebook. Three lucky winners will also be selected for a $1,000 shopping spree. About Poppy: Poppy is Coach’s newest collection of vibrant and edgy handbags and accessories debuting this summer. Mixing a preppy East Coast vibe with punky sensibilities, Poppy features many of Coach’s coveted trademarks, including vintage shapes, girly details, and quirky hardware and fabrications. Beginning July 1st, Poppy will available for purchase in all Coach locations and online at www.coach.com/Poppy. - Sparkling juices, sliders, pomme frites, and mini cupcakes are among the treats that will be served. - Photobooth will be in front of store and functioning during event hours.